While I enjoy my winter break from vegetable gardening and its attendant obsessions, by the end of January I'm itching to plant some seeds. I know I am not alone! Yet I've learned through experience that some veggies can be pushed to start growing quite early, sometimes as winter-sown crops, but with others early planting is a waste of time. Take the cabbage family, for example. Of all the cabbage cousins I'm likely to plant in spring (broccoli, cabbage, collards, kale, and kohlrabi), only cabbage and kale are good candidates for early planting indoors and setting out under cloches while cold weather reigns. The others simply will not grow as long as the soil stays cold, so I wait a few weeks to start those seeds. Like cabbage and kale, leaf lettuces are quite forgiving of cold conditions, so I often indulge my compulsion to plant by sowing pinches of lettuce seeds in containers with translucent lids. Kept under lights, the seedlings grow to cutting size in a little over a month. After snipping off the first set of leaves (enough for a sandwich), I harden off the sheared plants and transplant them to the garden under cloches. Because of their large root systems, the plants quickly regrow into sturdy lettuce plants. This time of year, I derive the most satisfaction from working with onions, because onion and shallot seedlings really do benefit from early planting indoors under lights. Their skinny upright leaves put them at a disadvantage when it comes to collecting solar energy, so they simply take a long time to grow. To me it is a happy reality that to have pencil-size onion seedlings to set out in April, I must start the seeds by mid-February. Here I know I have plenty of company, because my 2012 blog on growing onions from seed now has 75 thoughtful comments and questions. Many fellow onion fans share an interest in food self-sufficiency, a potent motivator for making an early start with onions. Some folks in Ohio (north-central USA) say they grow fifteen thousand onion seedlings, starting in December. I'm impressed! At my place, two or three seed trays of onion seedlings keep me busy until indoor seed-starting expands to include a dizzying array of veggies, herbs and flowers. The worst veggies for extra-early planting are those that need warm air and soil, and are set out after the last frost has passed – eggplant, peppers and tomatoes, as well as all members of the cucumber family. Seedlings that are started too early become lanky and overgrown while they wait for warm weather, and require constant potting up to keep them from becoming root bound. By keeping garden records, I have learned that several "cool-season" veggies often recommended for early planting - notably beetroot, carrots and peas - cannot be counted upon to grow before their time. Assuming the seedlings will stay alive under tunnels or other covers, they won't show fast, healthy growth until the middle of April, when soil temperatures rise to a point where the soil food web becomes active – about 45°F (6°C) 4 inches (10 cm) deep. Where I live, climate records show that soil temperatures at root depth range between 40°F and 44°F (4°C to 5°C) through the month of March. But by April 15 a big rise occurs, to above 55°F (13°C), and this warm-up makes a huge difference to these vegetables. Whether they have been sitting there sulking or have just been sown, the little plants suddenly grow faster and better. So, rather than battle slugs, wind and other vagaries of early spring, I wait for the end of March to start planting carrots, beetroot and peas. An immediate cure for the can't-wait-to-plant syndrome is to take up winter sowing of seeds that benefit from a period of moist chilling, or cold stratification. Many shrub and tree seeds fit into this category, but numerous wildflowers and herbs like Echinacea, sage, and even parsley or celery can also be handled using winter sowing methods. 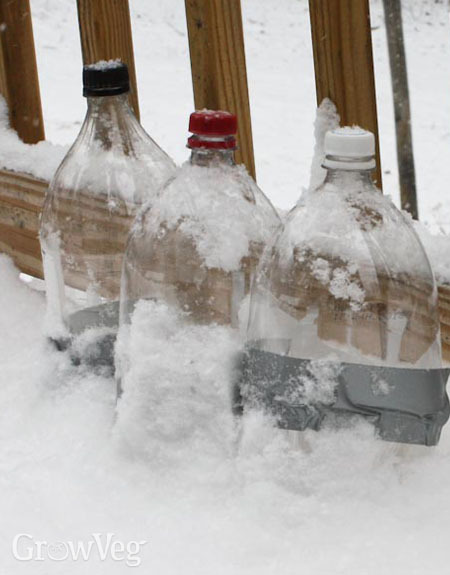 Instead of using space in your fridge for cold stratification, you fashion planting chambers from plastic bottles by cutting them in half but for a small hinge. After punching drainage holes in the bottom, seeds are planted in moist potting compost in the bottle bottom, and then the bottles are taped shut and labelled. The seeds germinate when they are ready, and as the weather warms the tops can be opened for ventilation. Sometimes winter sowing works and sometimes it doesn't, but when it does you get sturdy, cold-hardened seedlings for very little effort. "I enjoyed this post, but wanted to know in which state Ms Pleasant lives so that I may adjust my planting schedule. This is my first time trying to start seedlings indoors and I can use all the help I can get." "Michelle, I am in Zone 6b with a last frost date in early May. Your GrowVeg planner will be of tremendous help in finding your best planting dates all season long. Good luck!" "I live in Virginia (zone 7) It is still freezing overnight. 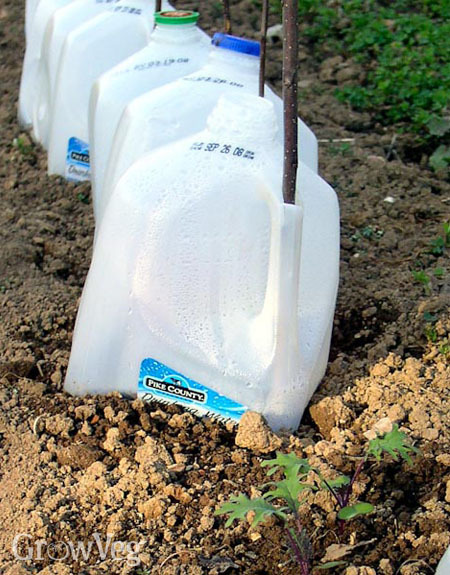 Would it hurt to plant patatos in february and cover them with plastic? Thanks, Michel"
"Michel, potatoes planted early often are nipped back by frost. They do recover, but it is best to plan for uninterrupted growth and hold your seed potatoes until the proper planting time. My 2011 blog and comments on "What to Do With Sprouting Potatoes" should make good reading, too. http://www.growveg.com/growblogpost.aspx?id=180 "
"Hi I would like to start some onions seeds early in my greenhouse which would you recommend heat mat or heat the greenhouse with a heater I have a glass greenhouse thanks"
"Pam, rather than heating the greenhouse, either germinate the seeds indoors or use a heat mat. Once the little plants are up and growing, they can stay in the glasshouse as long as temps rarely go below 45F/7C. Exposure to too much chilling can trigger bolting. Good luck! "